Srinagar: A complete shutdown is being observed across Kashmir valley on Monday to mark the 35th hanging anniversary of Jammu and Kashmir Liberation Front (JKLF) founder Maqbool Bhat. Bhat was executed in Tihar Jail on this day in 1984 and was buried inside the prison premises. The call for shutdown was issued by the Joint Resistance Leadership (JRL), comprising of octogenarian Hurriyat patriarch Syed Ali Geelani, Mirwaiz Umar Farooq and Muhammad Yasin Malik. In a statement, the trio reiterated their demand to hand over Bhat’s remains to his family. 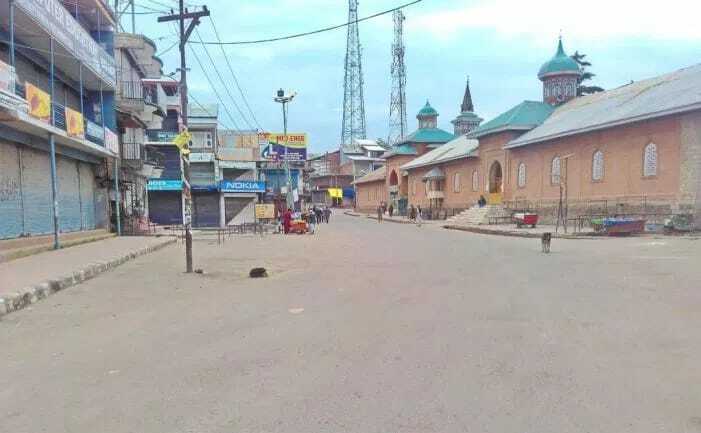 Reports said that all the shops and other business establishments are shut across Kashmir while public transport is off the roads. A thin movement of private transport was visible on Srinagar streets. They said that the government has made heavy deployment of government forces at several places in Srinagar, and other district headquarters and in Trehgam, Bhat’s hometown in northern Kashmir’s Kupwara district. The authorities have either detained the resistance leadership or have placed them under house detention. While Geelani, continues to remain under house arrest since 2010, a posse of police on Friday afternoon reached the Nigeen residence of Mirwaiz Umar and detained him at his residence. JKLF chief Yasin Malik was arrested on Friday and detained at Kothi Bagh Police station.